Raiders of the North Sea is the brightest, breeziest way to pillage the shores of Europe I’ve ever had the pleasure of playing. It’s a worker placement game for 2-4 players, where everyone is in competition to build up a crew of bloodthirsty marauders, secure provisions then head out raiding monasteries and villages in an attempt to gain the favour of the Viking chieftain. The core of the game is pretty simple: everyone starts the game with one little viking token. You place that token on an area of the map and are able to perform the action listed on it. You can then pick up a different token already on the map, keep it and perform that action. The way this is implemented here is a masterstroke. You can only place your token on a vacant slot, and you can only pick one up that someone else has already placed down. So while you may have an overarching strategy, each turn is as much about making the best of what’s on offer rather than meticulously planning your way to victory. At the beginning of the game, the actions you can perform are limited to preparations, as you gather a crew, earn some money, collect provisions and bolster your combat strength. But after a few turns, once everyone has enough gear to head out on the seas, the real fun begins. The heart of Raiders is heading out and ransacking the surrounding countryside, gradually working your way up from the easiest targets (lightly-defended harbours) to the most difficult (giant fortresses). Every raid you perform will cost you something, whether supplies, crew or money (or all three), but you’ll generally also make off with some valuable loot like gold and livestock. There’s not much to the combat; each raid has a pre-requisite cost that you either meet or don’t, with the only variable being a few dice rolls in more difficult encounters that can help you grab some bonus points. The catch is not how tough Raiders’ fighting is, but rather how quickly and smartly you do it at all, since you can only raid each location once: as soon as a player has taken its loot, it’s done for and nobody else can claim it. While this makes the game sound like a race, it’s anything but. The overall goal is to please the Chieftain, not raid settlements, and there are a number of ways you can do this. Players earn points for raiding, yes, but you also get points for each viking killed in a raid, points for livestock and gold accrued, and you even get points for how many times you’ve upgraded your combat power. This, combined with the snappiness of player turns, is what makes this such a fun game. My buddies and I liken Raiders to a kind of Scythe Lite: the same base is there, of constantly having to assign workers to tasks, and dabbling in combat and resource gathering, but it’s all a lot simpler, and faster. There’s also the same sense of constant uncertainty born of so many routes to victory: it’s often impossible knowing who’s winning the game until the scores are tallied at the end, something I love in my board games because it keeps things interesting all the way through. I don’t just love the way Raiders plays, though; as an incredibly superficial gamer I also adore its looks, courtesy of some wonderful art by Mihajlo Dimitrovski. 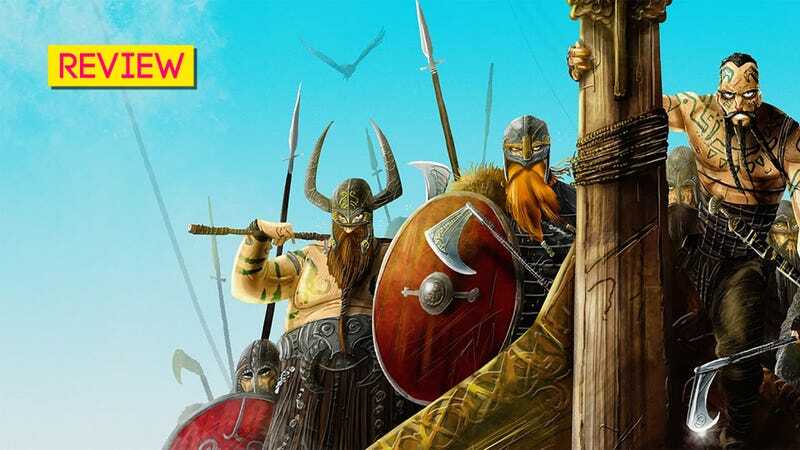 The main map is fine, whatever, but the game comes alive on its packaging and crew cards, with a rowdy cast of individual and wildly different vikings giving the game a sense of flavour and personality that many of its competitors in this space lack. The cards above are just a small selection of the crew available to recruit; there are a lot more, including a handful of hero characters with extra powers. One last thing I really liked was the smart inclusion (supported by Kickstarter stretch goals) to include real metal coins with the game. I cannot overstate how important metal coins are to a board game. They turn an otherwise rudimentary action—paying for things with fake money—into something truly satisfying, and add genuine value to transactions that just don’t feel as meaningful with cardboard tokens. Most Raiders games will be done with in around 60-90 minutes, so it’s not something you’d plan an entire session around. But as a sharp, well-executed take on worker placement that plays to its theme perfectly and looks great while doing it, Raiders of the North Sea is one of the best mid-range games I’ve played in ages.